Having ended a four-game losing streak in all competitions, Mervue United will be anxious to garner the full complement of spoils when they visit Ferrycarrig Park tomorrow for a clash with Wexford Youths. Last Saturday's Airtricity League first division triumph over Cobh Ramblers was a morale-boosting result that nudged Mervue back into second place in the table. Johnny Glynn’s charges currently trail standard-bearers Longford Town by nine points, but Tony Cousins' team faces an awkward assignment against Athlone Town. That means Mervue have a real chance to cut the gap if they can summon another solid display in the south east, but Wexford can be durable opponents when in the mood. 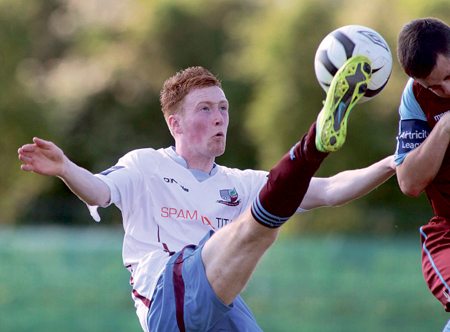 Ryan Manning capped another fine performance with a crucial goal as Mervue were sufficiently composed to shrug off Cobh's stubborn resistance. It was a demanding encounter for Mervue but, having dropped away from Longford, the success puts them back into a healthy position. There is no doubting it is a particularly tight competition this year, Longford appear to possess a bit more depth than the other challengers, who are packed together. Two points separate Mervue from sixth-placed Waterford, which illustrates how closely contested the football has been throughout the campaign. Mervue are completely aware that were Wexford to prevail, they would climb above them in the table, so there is plenty at stake in Ferrycarrig. Wexford have a reasonable record at home, claiming four victories from their six fixtures; Mervue have only won once on the road so improving that statistic is certainly a mission. For Salthill, Enda Curran maintained his excellent goalscoring form in the RSC on Saturday, but they were still outfoxed by Waterford United. The loss leaves Salthill isolated at the bottom of the standings, five points from the nearest outfit Cobh. Tomorrow Salthill host Finn Harps, who are quietly confident of launching a promotion bid despite a mixed start to the year. Peter Hutton has assembled a squad with a nice blend of youth and experience and they will be striving to boost their account from the trip to the basement boys. Though Salthill are last, they have been slightly unfortunate in several matches and compared to other campaigns not as many drubbings have been suffered. For all Salthill's pluck however, the defeats continue to mount. With only one win since March points need to be put on the board quickly and regularly over the coming weeks and months.